A Monthly Publication Devoted to Spiritual Science—Spiritual Phenomena. San Francisco, CA. Editor: Albert Morton, editor and publisher. 1/1, June 1889-1/12, May 1890. $1.00 a year, 32 pp. Morton was a very early spiritualist and his transformations mirror those of spiritualism itself. This journal was an interim project apparently devoted to Morton's recollections of the mediums he had encountered, including Susan Grimshaw of Milwaukee in the early 1860s, the Davenport Brothers and William Fay, Helen L. Palmer (Wiltse), Charles H. Foster, Henry Slade (with whom he lived for a time), W.H. Mumler, Henry B. Allen ("The Allen Boy"), and others. Morton presciently predicted the future in opining that "Southern California presents the most favorable conditions for the development of mediumistic powers, and . . . it may yet become the Mecca of Spiritualists." 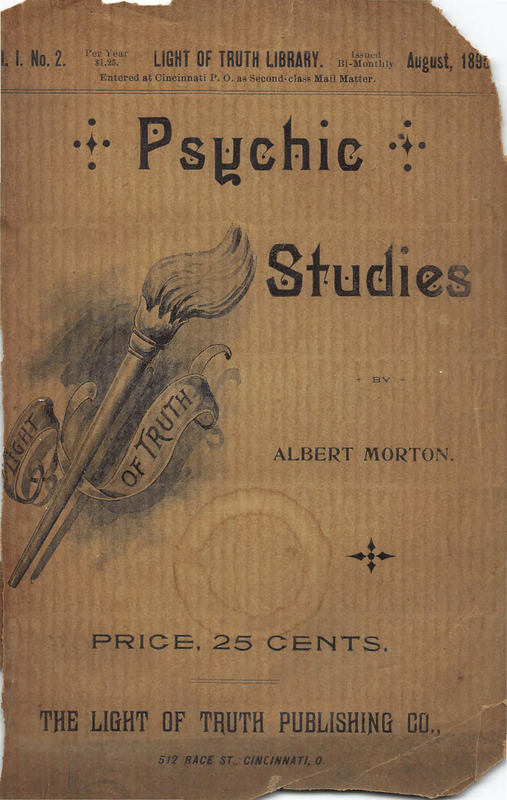 The journal also featured prominent advertisements for the Summerland Colony, for which Morton was an agent, and for his wife, who was a "Spirit Medium for Diagnosis of Disease; Psychometric and Prophetic Readings." On Morton, see the note under Summerland. NSAC Lily Dale has 1/12 only (the last issue).